Speciesism : a belief of humans that all other species of animals are inferior and may therefore be used for human benefit without regard to the suffering inflicted. Speciesism is a term coined by Richard Ryder in 1970. The word refers to the widely held belief that the human species is inherently superior to other species and so has rights or privileges that are denied to other sentient animals. ‘Speciesism’ can also be used to describe the oppressive behavior, cruelty, prejudice and discrimination that are associated with such a belief. 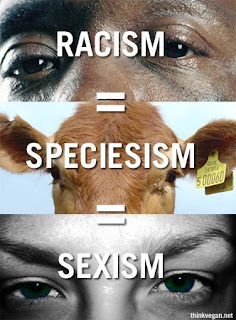 In a more restricted sense, speciesism can refer to such beliefs and behaviors if they are based upon the species-difference alone, as if such a difference is, in itself, a justification. Philosopher Tom Regan argues that all animals have inherent rights and that we cannot assign them a lesser value because of a perceived lack of rationality, while assigning a higher value to infants and the mentally impaired solely on the grounds of being members of a specific species. Others argue that this valuation of a human infant, a human fetus, or a mentally impaired person is justified, not because the fetus is a fully rational human person from conception, nor because the mentally impaired are rational to the same degree as other human beings; but because the teleological and genetic orientation of any human being from conception is to develop into a rational human being and not any other creature, and because all humans have an implicit origination from two genetically human beings, and hence, both a primary genetic orientation and primary origination as the reproduction of other human beings, even if in a not fully developed state or if partially impaired. In this view, anyone who is born of human parents has the rights of human persons from conception, because the natural process of reproduction has already been initiated in biologically human organisms. I came across this word when I was doing research and was unaware of its meaning. I assumed it had a negative connotation and had to do with prejudices against animals. After reading more about it and looking at various quotes and books relating to the subject the word itself does not have any connection to my work. If it does I have a problem. I do not want my images to be looked at an an animal rights statement but as the communication, connection, and consciousness between species.